3 and a Half Meters: Committee�s Choice, is hosted in the Main gallery of the AVA. Existing AVA committee members, Stacy Adriaans, Matthew Blackman, Caroline Coates, Chantel Louw, Marilyn Martin, Richard Mudariki, James Nilsen, Chad Rossouw, Elgin Rust and Cobus van Bosch, have each selected a work or works by contemporary artists to be exhibited in their allocated three and a half meters. Featured artists include Lynette Bester, Kurt Campbell, Mary-Rose Hendrikse, Ren�e Holleman, Pieter Hugo, Frances Marais, Elsab� Milandri, Mads N�rsgaard,Conor Ralphs, Chad Rossouw, Adolf Tega and Gavin Younge. In the Long Gallery Aidon Westcott�s exhibtion Replica of Memory features a body of mixed media works filled with symbolic imagery aimed at awaking forgotten memories in the subconscious mind. 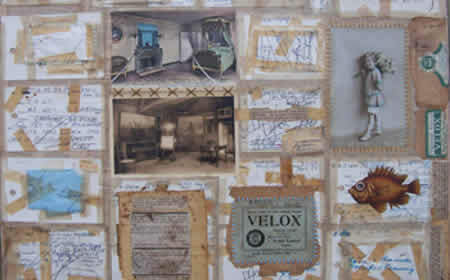 The imagery is build up in layers of antique packaging and selected ephemera through the medium of collage combined with hand stitching, thread and oil paint. Ilen� Bothma explores the strangeness of the domestic space in her new exhibition Weird Marriage. The relationships that play out within the domestic space, the repetitive activity of human labour , the poetics of the everyday intimacy are investigated through sculpture, video and installation works installed in the Artsstrip. 3 and a Half Meters: Committee�s Choice, Replica of Memory and Weird Marriage open at the AVA at 6:00pm on 6 May and closes on 30 May.